In March and April 2018, the 10th International Symposium Cephalopods—Present and Past (ISCPP) was held in Fes, Morocco. Meeting and the post-conference fieldtrip were organized by representatives of the Westfälische Wilhelms-Universität, Münster, the Mohammed V University of Rabat and Hassan II Academy of Sciences and Technology, the University Sidi Mohammed Ben Abdellah, Fes, University Hassan II, Casablanca, and the University of Zurich. We dedicate this proceedings volume to the memory of Prof. Dr. Jürgen Kullmann, who passed away in 2018. Editorial Handling: M. R. Sánchez-Villagra. From the 25 March to 3 April 2018, the 10th International Symposium Cephalopods—Present and Past (ISCPP) was held at the Hotel Palais Medina & Spa in Fes, Morocco (Hartenfels et al. 2018). Oral and poster presentation on fossil and extinct cephalopods were given between March 26th and 28th. Previous meetings in this series were held each 3–4 years in York, Tübingen, Granada, Vienna, Fayetteville, Sapporo, Dijon, and Zürich. Its essential idea is to bring researchers together from all over the world working on all groups of cephalopods from their origin in the Cambrian to the Recent including a wide range of research fields, such as phylogeny, (palaeo-) ecology, systematics, stratigraphy, palaeogeography, anatomy, morphology, development, behaviour, etc. Unfortunately, the number of participants decreased steadily from the meeting in Vienna in 1999 with over 200 attendees via Zürich in 2014 with about 110 participants to Fes in 2018 with around 70 researchers present. We hope that the next meeting in London in 2021 will attract more colleagues since travel costs or efforts will be no excuse any more, at least for the European colleagues. Morocco was chosen as the host country because of its extremely rich and famous occurrences of cephalopods of most groups and almost all ages (except for the Cambrian, Permian and Triassic). Particularly in mid-Palaeozoic, Jurassic and Cretaceous strata, cephalopod fossils are highly abundant and of course, the Atlantic Ocean is inhabited by living species. Accordingly, a six-day fieldtrip through the Middle Atlas and via the High Atlas into the eastern Anti-Atlas was organized by the colleagues from Moroccan Universities in cooperation with the team of RTB from Münster. On Monday morning, 26 March 2018, the meeting was opened by welcome speeches of Prof. Dr. Omar Assobhei (President of the University Sidi Mohammed Ben Abdellah, Fes), Prof. Dr: R. Thomas Becker (Westfälische Wilhelms-Universität, Münster) and Prof. Dr. Ahmed El Hassani (Mohammed V University of Rabat, Scientific Institute). The opening key note was held by Peter Ward (Washington), who delved into the results of his recent research on modern nautilids. The technical sessions were largely arranged in partially stratigraphic and partially phylogenetic order; therefore, the first session was dedicated to Palaeozoic nautiloids. Andy King and David Evans put a new classification scheme for nautiloids for discussion, which shall be used as basis for the new Treatise on Invertebrate Paleontology K. Vojtech Turek (with Stepan Manda) then showed images of excellently preserved fossils of early ontogenetic stages of Palaeozoic nautiloids. Kathleen Histon returned to her favourite group, namely Silurian cephalopods from the Carnic Alps. Subsequently, Alexander Pohle and CK presented their analyses of size changes of nautiloid conchs through the Silurian and Devonian of Morocco. The first morning ended with talks by Larisa Doguzhaeva about a supposed Devonian coleoid from Russia and a discussion initiated by Andy King and David Evans on the future of the nautiloid Treatise. In the afternoon, Stijn Goolaerts reflected on the nautilid turnover across the C/Pg boundary and CK et al. speculated on mouthpart evolution in the Palaeozoic. The next session was dedicated to Palaeozoic ammonoids with Kenneth de Baets et al. speaking about the German Hunsrück Slate while Till Söte et al. focused on the early Famennian ammonoid radiation in Australia, and Dieter Korn et al. analysed the stratigraphy and palaeobiogeography of Famennian ammonoids of southern Morocco and Algeria. Stijn Goolaerts et al. then returned with another talk on Late Devonian ammonoids from Belgium. RTB and Sven Hartenfels suggested links between sea-level changes and ammonoid distribution patterns in the Late Devonian while Svetlana V. Nikolaeva described Carboniferous ammonoids from a Russian reef-setting jointly with Vera A. Konovalova. The next morning was filled with presentation on coleoids, opened by Larisa Doguzhaeva giving a key note on the evolution of endocochleate cephalopods. CK et al. provided anatomical details for a Carboniferous species of coleoids, DF et al. showed how the octopod gladius vestige evolved, and Martin Košták et al. told us about sepiid ancestors. The famous Christian Malford-coleoids were re-examined by CT scanning by Zoë Hughes and Malcolm Hart. Patrizia Rita et al. provided a thorough account on body size changes in belemnites across the Pliensbachian-Toarcian crisis. Jointly with Dimitri B. Gulyaev, Alexander P. Ippolitov gave a detailed account of the palaeogeographic distribution of Middle Jurassic belemnites in Russia. The following eight talks showed possible ways of cephalopod research into the future: New data on aragonite versus calcite in the shells of various cephalopods were provided by René Hoffmann, Kenneth De Baets and Alexander P. Ippolitov with their respective co-authors. Neil H. Landman et al. and Ben Linzmeier et al. employed stable isotopes to respond to palaeobiological questions concerning Cretaceous cephalopods. Robert Lemanis showed his conclusions on the function of ammonoid septa based on carefully segmented CT image stacks of ammonoids, and Mikhail Rogov introduced the first pseudoinversions of septal sutures in Middle Jurassic–Lower Cretaceous non-heteromorph ammonites. Nicholas Hebdon could not attend the meeting; hence, KR presented his results on ammonoid hydrodynamics using virtual 3D models. Greg J. Barord and Peter D. Ward used baited remote underwater video systems to study wild Nautilus. The last presentation of the day was given by Walter Etter, who reviewed the history of cephalopod research. The evening ended with the conference dinner in the old town of Fes with a splendid view over the Medina. Dieter Korn fulfilled the tough task to start the day after the conference dinner with a keynote (Kiessling et al.) providing new data on the pre-mass extinction decline of latest Permian ammonoids. He therefore opened the last session on post-Carboniferous ammonoids and was followed by Lance L. Lambert et al., who examined the intricate sutures of cyclolobids. KR and Nicholas Hebdon then suggested that Early Jurassic serpenticones had a rather lower metabolism. Ammonoid intraspecific variability throughout ontogeny was the title of the next talk given by Carina Klein and Neil H. Landman. Mikhail Rogov asked the audience whether we knew further occurrences of inverted suture lines resembling those he showed. Intraspecific variation of heteromorphic ammonoids was the interesting topic studied by René Hoffmann and Co-authors. Christina Ifrim and Wolfgang Stinnesbeck claimed that they found the world’s largest puzosiids in north-eastern Mexico supposedly exceeding two metres in diameter. Alexander Mironenko et al., who have access to excellent Russian materials, showed us images of new discoveries of ammonite jaws. Margaret ‘Peg’ M. Yacobucci found a relationship between cephalopod size range and survivorship across the Cenomanian–Turonian boundary. Amane Tajika et al. suggested that holoplanktonic gastropods replaced ammonite hatchlings ecologically after their demise at the end of the Cretaceous. James D. Witts et al. examined ammonoid diversity and ecology in the Maastrichtian of the USA. A related topic was then presented by Christina Ifrim, followed by a short general discussion by René Hoffmann on Cretaceous ammonoid research. The day ended with presentations by AEH and RTB on the geology and palaeontology of the Middle, High, and Anti-Atlas. A final general discussion round dealt with future tasks of cephalopod research. The fieldtrip started on Thursday, March 29th (El Hassani et al. 2018). The first outcrop in the Middle Atlas showed a particular facies, possibly unexpected to some, namely a Toarcian Ammonitico Rosso rich in ammonoid genera (Fig. 1b) that occur in Europe as well. We then drove into the Middle Atlas and examined Middle and Late Jurassic cephalopod-bearing outcrops of the Amrar Ridge. The rest of the day was occupied by the long trip through the scenic High Atlas to Erfoud. On Friday morning, Lahssen Baidder, AEH and RTB explained the sedimentary sequence of the Tafilalt from the Ordovician into the Devonian with cephalopod-rich strata particularly in the Late Silurian to Late Devonian. The Bou Tchrafine ridge south of Erfoud served as the reference section. In the afternoon, AEH, RTB and CK guided the group through the fantastic, now deserted formerly underwater world of Hamar Laghdad, beginning with the Lochkovian pepperites into the massive limestones of the Emsian, which form the Hamar Laghdad Ridge with its perfectly exhumed carbonate mudmounds. It is particularly the overlying strata that are often very rich in cephalopods and other fossils. The visit of Hamar Laghdad ended with a visit of the Hollard Mound at its eastern end, which is the youngest of the mound structures showing a peculiar vent facies with palaeoecologically interesting biofacies of monotypic vent bivalves, etc. On Saturday, we began with the stratigraphically important locality Jebel Mech Irdane, where we visited the Eifelian/Givetian boundary GSSP. Before, however, we looked at early Emsian strata on the quest for the possibly oldest ammonoids of Gondwana and succeeded by finding reasonably well-preserved specimens, which are described in this volume (Klug 2001; Becker et al. 2019). In the afternoon, we visited the adjacent synclines of Jebel Ihrs and Jebel Mdouar, where strongly condensed cephalopod limestones of Eifelian to Frasnian age are exposed. Some focus lay on the cephalopod coquinas at the Frasnian–Famennian boundary. Before returning to the hotel, we visited the Tahiri Fossil Museum between Erfoud and Rissani, which houses many fine specimens of mostly Palaeozoic invertebrate fossils (particularly trilobites but also cephalopods and echinoderms). Easter Sunday, 1 April 2018, was celebrated beginning with the highly fossiliferous Ludlowian to Famennian strata in the Amessoui Syncline between Taouz and El Atrous. For lunch, our drivers supported by L. Baidder prepared a gorgeous Moroccan barbecue in the ruins of El Atrous. In the afternoon, we focused on Famennian to Tournaisian cephalopods between El Atrous and Oum El Jerane. On 2 April 2018, we visited the well-studied sections around Madene El Mrakib in the Maïder Basin. Some of the Famennian strata are extremely fossiliferous, and in a very short time, it is possible to collect tens of cephalopod taxa. We also shortly dug into the thin-bedded shales of the Hangenberg Black Shale, which contains carbonized jaws of several ammonoid species. The last day (3 April 2018) was mostly filled by driving back to Fes. On our way, we visited fossiliferous outcrops of the Jurassic in the High Atlas. Near Ait Athmane, we first looked at shallow water carbonates with large corals, 20-cm-long gastropods and huge bivalves. Further down the road, we searched for Liassic ammonites. In the early afternoon, we visited the last outcrop near Tizi n’Talghemt (2260 m), where abundant Toarcian ammonites (mostly flattened) occur in situ. Prof. Dr. Jürgen Kullmann, a world-renowned cephalopod researcher, died on 21 August 2018 at the age of 87. In our community, he was particularly well known for his publications on Palaeozoic ammonoids and for the establishment of the Palaeozoic ammonoid online database GONIAT (http://www.goniat.org), which he initiated, followed by the major input of Dieter Korn and his son Peter Kullmann (Becker and Nikolaeva 2018). The database is now curated by Svetlana Nikolaeva; it represents one of his main contributions to cephalopod research (e.g. Kullmann et al. 1993; Kullmann and Korn 2000; Kullmann 2007, from then on GONIAT online: http://www.goniat.org). Jürgen Kullmann was born in Berlin on 23 May 1931, where he also went to school and received his high school diploma (Abitur) on 3 June 1950. First, he studied Geosciences in Berlin before he moved to Tübingen to continue his studies there. There, he became a student of the famous ammonoid researcher Otto H. Schindewolf, who shaped post-war palaeontology in Germany. Being himself a Palaeozoic and ammonoid researcher, Schindewolf initiated a kind of golden age for these two research fields in Germany. Many of his students became influential palaeontologists themselves. This includes Prof. Dr. J. Kullmann, who completed his Ph.D. thesis in 1960. This work was dedicated to Devonian and Carboniferous goniatites of the Cantabrian Mountains in Northern Spain, which led to several important publications (e.g. Kullmann 1960, 1961, 1962, 1963a, b). Subsequently, he moved on and obtained his postdoctoral lecturer qualification (habilitation/venia legendi) with his monographic work on ‘Rugose Korallen der Cephalopodenfazies und ihre Verbreitung im Devon des südöstlichen Kantabrischen Gebirges (Nordspanien)’ (‘Rugose corals of the cephalopod facies and their distribution in the Devonian of the south-eastern Cantabrian Mountains (northern Spain)’; Kullmann 1965, 1966). With this work, he followed thematically his supervisor O. H. Schindewolf. From 1967 to 1968, he visited Bill Furnish and Brian F. Glenister in Iowa City, USA, for joint research. Three years later, he first became extraordinary professor at Tübingen and in 1978 full professor. With this employment, he became part of a strong invertebrate research group including the Craford Award-winner Prof. Dr. ‘Dolf’ Seilacher, the Cretaceous ammonite expert Prof. Dr. Jost Wiedmann (Kullmann and Wiedmann 1970), the sedimentologist and invertebrate palaeontologist Prof. Dr. Jobst Wendt accompanied by two professors in micropalaeontology. With these employments, some decades of world-class palaeontology teaching found its continuation after Schindewolf’s era, and Kullmannwas was a part of the German ‘Mecca’ of palaeontology. 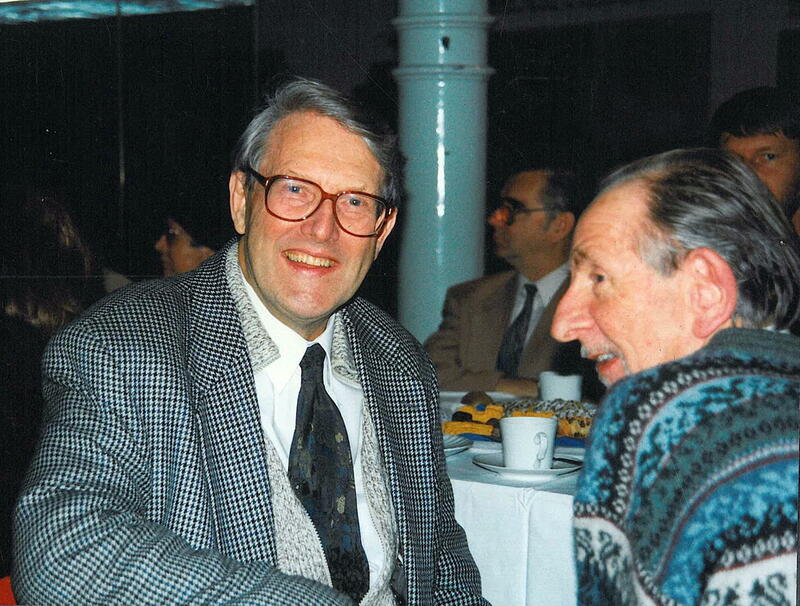 In the context of the proceedings volume presented here, we need to emphasise another important achievement: In 1985, J. Wiedmann and J. Kullmann organized the 2nd International Symposium Cephalopods—Present and Past in Tübingen, which was dedicated to the memory of O. H. Schindewolf. The proceedings volume was published in 1988. It contains many ground-breaking papers in cephalopod research and is well known to every cephalopod palaeontologist today (Wiedmann and Kullmann 1988). We cannot list all of his achievements (for another obituary, see Nikolaeva and Becker 2018), but we do have to mention some of his main merits. For example, he contributed at an early stage to ammonoid–conodont correlations (Kullmann and Ziegler 1970). The joint publications with Dr. J. Scheuch and Dr. R. Kant have a pioneer character in terms of examining ammonoid ontogeny quantitatively (e.g. Kullmann and Scheuch 1970; Kant and Kullmann 1988). We shall also mention his important contribution to the famous ‘Red Book’ on ‘Ammonoid Paleobiology’ (Becker and Kullmann 1996) and, more recently, he revised the Treatise on Invertebrate Paleontology, part L of Carboniferous and Permian ammonoids, jointly with three colleagues (Furnish et al. 2009). With his about 150 publications, GONIAT as well as the Carboniferous/Permian goniatite Treatise, he deserves a prominent position in the hall of fame of ammonoid research (Fig. 2). In this volume, we present twelve novel publications covering much of the evolutionary history of cephalopods. There are several contributions dealing with early cephalopods. For example, King and Evans (2019) propose a new systematic scheme for early cephalopods as a preparation for the new nautiloid Treatise on Invertebrate Paleontology. Manda and Turek (2019) show excellently preserved embryonic conchs from the Silurian. Doguzhaeva (2019) reports the first case of aragonite and organic preservation in a Devonian orthoconic cephalopod. Pohle et al. (2019) introduce a new genus of large Devonian oncocerids. Following the tradition of the Cephalopods—Present and Past-symposia, this volume contains also several papers on ammonoids. Becker et al. 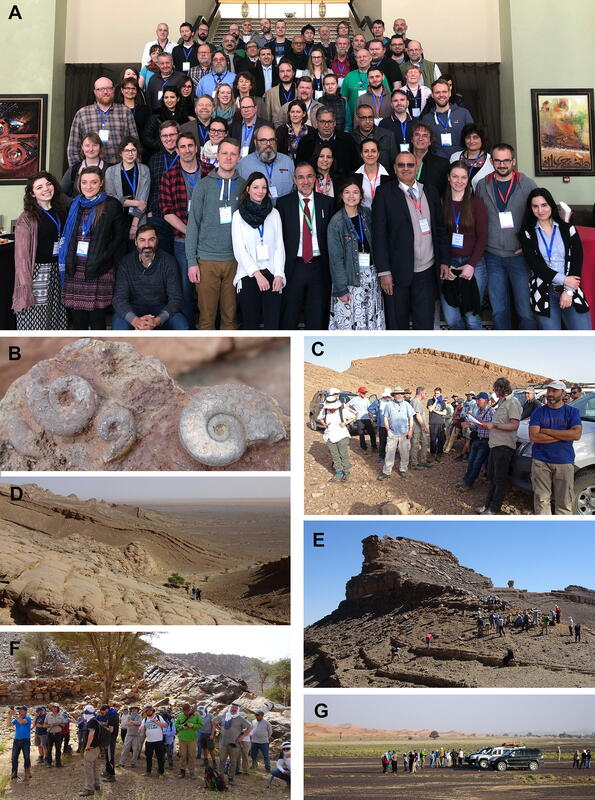 (2019) present new record of the oldest ammonoids from Morocco, possibly even from the whole of Gondwana. 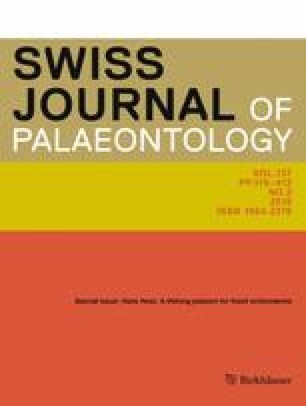 Klug and Vallon (2019) interpret organic structures from the Famennian Hangenberg Black Shales as regurgitalites of predators that fed on ammonoids and regurgitated the shell fragments. Mapes et al. (2019) document pairs of ammonoids from the Carboniferous of Bear Gulch and the Jurassic, which might have died during mating or other activities. Brack and Rieber (2019) introduce a new ammonoid genus from the Triassic Latemar Platform. Linzmeier (2019) consolidates his reputation as a young researcher employing sophisticated state-of-the-art methods with his article on oxygen isotopes in fossil cephalopods. Rogov (2019) reports new findings of ammonites with inverted sutures. Unfortunately, there are no contributions this time on Recent cephalopods, but at least, there are two contributions on coleoids. Fuchs (2019) discusses possibly homologous structures in the embryonic conch such as the caecum and the first septa. Košták et al. (2019) present new Palaeogene sepiids from the Mediterranean, and put these discoveries into the larger context of diversity and palaeogeographic distribution. In 2018, the series of meetings of the series International Symposium Cephalopods—Present and Past found its continuation in Fes and thus for the first time in Gondwana. We can conclude that this was a very friendly meeting with a good mix of researchers of a broad range of ages. With 70 attendees from 15 different countries, it was not the biggest meeting and this shows that our community needs to advertise our field of research in general and these meetings in particular. We look forward to the meetings in London in 2021 to be organized by Zoë Hughes and probably in 2024 under the leadership of Kathleen Ritterbush in Utah. Many colleagues helped with the preparation of the conference and the field trip in Morocco. We cannot list all of the organisers and helpers, but we wish to express our gratitude particularly to A. Boushaba, F. El Hassani (both Fes), Z. S. Aboussalam (Münster), S. Helling (Münster), S. Hartenfels (Münster/Cologne), L. Baidder (Casablanca), and the team of Münster M.Sc. and Ph.D. students (L. Afhüppe, L. Holderied, F. Lüddecke, A. Saupe, T. Söte, S. Stichling). Besides RTB, AEH and CK, F. El Hammichi, H. Tabyaoui (both Taza-Gare), B. Fedan (Rabat), L. Baidder (Casablanca), S. Hartenfels (Münster/Cologne) stood at our disposition as field guides during the fieldtrip. Of course, we also appreciate the work of our drivers who chauffeured us during the fieldtrip and prepared delicious picnics in the desert. Svetlana Nikolaeva (Moscow) provided biographical information of Prof. Kullmann. Ingmar Werneburg (Tübingen) kindly put some images at our disposal.